The Final Four Stage is set in WTBL Play-offs. Chulalongkorn, DPU, Shoot It D. and Sripatum University entered the Final stage. In the quarterfinal series Sripatum Uni beat PRU 94-45 as Ndoli Linda Victorine top-scored for the winners with 21 points and Kanokwan Prachuap Suk netted 16. Shoot It D edged BU 85-57, while Chulalongkor overcame SECCO 85-62. DPU beat TOA U19 52-33 as Rattayakorn Udomsuk stepped up with 24 points. Second-ranked host DPU (5-2) was smashed by top-ranked Sripatum Univ. (7-0) 71-48. Undefeated Sripatum Univ. have an impressive seven-game winning streak. Defending champion maintains first position with 7-0 record. DPU at the other side keeps the second place with two games lost. They share the position with Shoot It D. and Chulalongkorn. Bottom-ranked Rangsit (0-9) is still winless. This time they lost on the road their ninth consecutive match to fifth ranked SECCO (5-4) 95-59. SECCO maintains fifth position with 5-4 record. Rangsit at the other side still closes the standings with nine games lost. In the last two games of round 8 BU was destroyed by Chulalongkorn on the opponent's court 87-53. Shoot It D. outscored TOA U19 in a home game 90-56. Very expected game when 7th ranked BU (2-5) was crushed on the road by third ranked Chulalongkorn (5-2) 87-53. Chulalongkorn have a solid three-game winning streak. They moved-up to second place, which they share with Shoot It D. and DPU. BU lost third consecutive game. They keep the seventh position with five games lost. Rather predictable result when fourth ranked Shoot It D. (5-2) smashed at home 6th ranked TOA U19 (3-6) 90-56. Shoot It D. have a solid four-game winning streak. They moved-up to second place, which they share with Chulalongkorn and DPU. TOA U19 lost fifth consecutive game. They keep the sixth position with six games lost. Second-ranked host DPU (5-2) was smashed by top-ranked Sripatum Univ. (7-0) 71-48. Sripatum Univ. have an impressive seven-game winning streak. Defending champion maintains first position with 7-0 record. DPU at the other side keeps the second place with two games lost. They share the position with Shoot It D. and Chulalongkorn. First defeat of league's leader DPU (5-1) against fourth ranked Shoot It D. (4-2) 57-54 was the most important game of the last round. It ended at the same time the five-game winning streak of DPU. Shoot It D. have a solid series of three victories in a row. 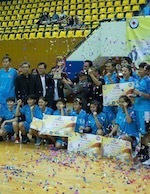 They moved-up to third place, which they share with Chulalongkorn. DPU at the other side dropped to the second position with one game lost. They were replaced at the leadership position by Sripatum Univ.. DPU will play next round against league's leader Sripatum Univ. trying to make it back to the top of the standings. Shoot It D. will try to continue on its current victory against sixth ranked TOA U19 at home. The game had a very big importance for second-ranked Sripatum Univ. as it allowed them to take a leadership position. Sripatum Univ. smashed 7th ranked BU at home 93-50. Undefeated Sripatum Univ. (6-0) have an impressive series of six victories in a row. As mentioned above they took over a top position. BU at the other side keeps the seventh place with four games lost. BU will play next round against strong Chulalongkorn trying to get back on the winning streak. Sripatum Univ. will try to continue on its current victory against second ranked DPU on the road. An interesting game was also a 21-point home defeat of 6th ranked TOA U19 in a game versus SECCO (#5) 87-66. SECCO maintains fifth place with 4-4 record. TOA U19 lost their fourth game in a row. They keep the sixth position with five games lost. SECCO will meet at home bottom-ranked Rangsit (#9) in the next round. TOA U19 will play against Shoot It D. and it may be a tough game between close rivals. Bottom-ranked Rangsit is still unable to win any game. This time they could not use their home court advantage losing their eighth consecutive match to third ranked Chulalongkorn (4-2) 103-48. Chulalongkorn maintains third place with 4-2 record having just two points less than leader Sripatum Univ., which they share with Shoot It D. Rangsit lost their eighth game in a row. They still close the standings with eight games lost. Chulalongkorn's next round opponent will be BU (#7). Rangsit will play against SECCO and hopes to get finally their first victory. The game had a very big importance for second-ranked Sripatum Univ. as it allowed them to take a leadership position. Sripatum Univ. smashed 7th ranked BU at home 93-50. Sripatum Univ. (6-0) have an impressive series of six victories in a row. As mentioned above they took over a top position. BU at the other side keeps the seventh place with four games lost. BU will play next round against strong Chulalongkorn trying to get back on the winning streak. Sripatum Univ. will try to continue on its current victory against second ranked DPU on the road.